As far as obstruction of Justice, Mueller said he didn’t reach a conclusion. He said he wanted the DOJ to decide. Barr said “Deputy Attorney General Rod Rosenstein and I have concluded that the evidence developed during the Special Counsel’s investigation is not sufficient to establish that the President committed an obstruction-of-justice offense.” He added that no obstruction statement had nothing to do with the DOJ policy against indicting a sitting president. He added that there are no sealed indictments, nor any other indictments. I wonder if Rep. Alan Schiff is going to broil or barbecue his Crow before he eats it. 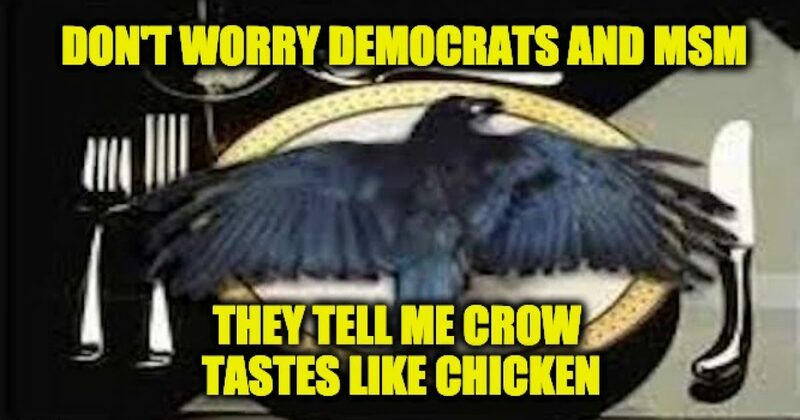 I also wonder when Senator Blumenthal (D-CT) eats crow about the Mueller Report will it be a Vietnamese Crow? If it isn’t a Vietnamese crow, will he lie and say it is? Rep. Jerry Nadler won’t move on. He will call just about everyone involved to testify before his committee. But then again, we are talking about the man who screwed his Jewish constituents to make nice to Obama by supporting the Iran deal. This whole thing reminds me of the final episode of Seinfeld. There was a year of buildup and when it finally ran it was a nothing burger. But unlike Seinfeld, this was a good thing for President Trump, but more importantly, it was a good thing for America, nobody worked with the Russians to skew the results of the election, not at the Trump campaign or anyone else. This two-year long American nightmare is over….well, except for the Democrats who put politics before this country and want to use their congressional offices to run hearings that are essentially opposition research for the 2020 presidential campaign.